A third successive away penalty save by Dennis Onyango and a Farouk Miya 40th minute goal handed Uganda their first ever qualifying win over Togo in five attempts on Thursday as the Cranes established an early advantage in the 2018 World Cup qualifiers. With the 1-0 lead now, the Uganda Cranes host the Togolese Sparrow Hawks in the return leg of the 2018 FIFA World Cup second round African Zone qualifier at the Nelson Mandela national stadium, Namboole on Sunday, 15th November 2015 aiming at avoiding defeat for them to progress. Togo’s last appearance in Kampala last October during the 2015 Africa Nations Cup group D qualifiers was that heart breaking 1-0 win over the Cranes before winning in Lome by a similar margin in the return leg. Both Uganda and Togo traveled to Kampala on Friday with Uganda the first to arrive via a chartered flight at 2:30 p.m while Togo arrived later at 11 p.m aboard Ethiopian Airlines. Coach Milutin ‘Micho’ Sredojevic has called upon his players not to get carried away by the slim first leg result but rather consolidate on the away performance and finish the job on home turf. ‘’It was a great performance away from home. I commend the spirit of the players and every other person whose work cannot be under-looked. I however challenge the players to finish the job on Sunday during the return leg as we look towards the up-coming group stage level’’. The team had a one hour light training at Nambole from 3 PM local time. However, first choice goal keeper Denis Onyango sat out of the training because of unease in one his shoulders but the coach said he will be available for the game. After the training, FUFA President Moses Magogo paid a visit to players in camp at Sky Hotel in Naalya to boost morale in the boys. Like Micho, Magogo appreciated the players for the effort of winning in Togo but also warned them that the job is half done. ‘’You have won the first half. Now you are remaining with another half of, So don’t sit back and think the work is done. He warned players. Football is funny in its way so you must be critical to make the mission possible on Sunday ‘’. Magogo added. Denis Onyango is expected in goal with Denis Iguma, Isaac Isinde, Murushid Jjuuko and Joseph Ochaya expected to retain their places at the heart of defence. Tony Mawejje and Aucho Khalid who covered all grass in Lome will anchor the midfield while Luwagga Kizito and Brian Umony may start ahead of Moses Oloya and Hamis ‘Diego’ Kiiza who struggled in the first leg. Therefore, Luwagga and Farouk Miya will be expected to take up wide positions as Umony Brian and Geoffrey Massa lead the hunt for goals. Denis Onyango (GK), Denis Iguma, Joseph Ochaya, Murushid Jjuuko, Isaac Isinde, Tonny Mawejje, Aucho Khalid, William Luwagga Kizito, Farouk Miya, Brian Umony and Geoffrey Massa. The Sparrow Hawks arrived in the country on Friday night with an almost unchanged squad from the one used in the first leg in Lome on Thursday. They had a feel of the playing turf at Nambole on Saturday evening and snubbed the media after the training. But as he told FIFA.com after the game in Lome, Coach Tom Saitfiet warned the Cranes not to celebrate yet upon the team’s arrival at Entebbe Airport. The Togolese have scored nine goals in seven matches against Uganda’s minimal three. Togo was part of the 2006 Germany FIFA World Cup while Uganda has never qualified for the event. 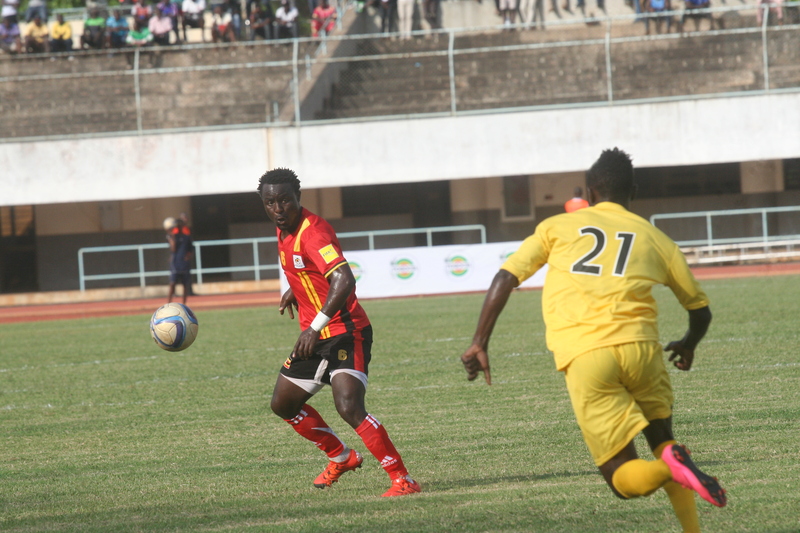 The 1-0 win for Cranes on Thursday was the first ever victory for Uganda against Togo in five qualifying attempts. It was also the first goal for Uganda against Sparrow Hawks. (Friendly games excluded). Togo is yet to lose to the Cranes in Kampala as their last two visits have ended in 2 wins, scoring four goals against none in the process. The Cranes have won only once in seven games against the Sparrow Hawks. Meanwhile the game will be handled by officials from Madagascar whereas the commissioner and referees assessor come from Mali and Tunisia respectively.